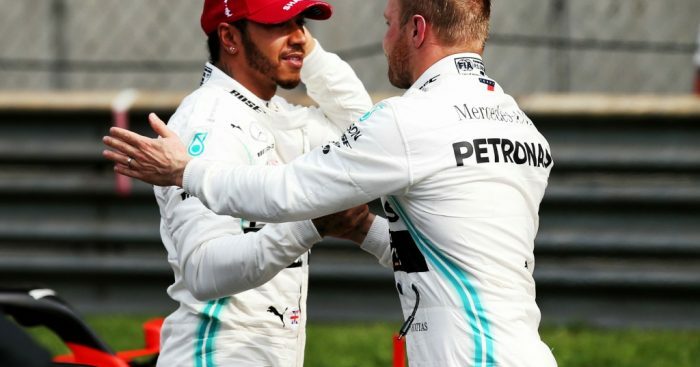 Ferrari may have had the straightline speed but over a complete lap it was Valtteri Bottas who was quickest in qualifying, grabbing pole position in China. Bottas set the pace in Q1, fastest with a 1:32.658, before Lewis Hamilton edged him in Q2, a 1:31.637 for the reigning World Champion on the medium tyres. Surprisingly Ferrari, led by Sebastian Vettel, were six-tenths down. Although the Scuderia had the better straightline speed, it was noted by many that their SF90 was extremely slow through slow corners. Going into Q3 the big question was tyre choice: soft or mediums. However, all 10 drivers opted for soft Pirellis. Bottas claimed provisional pole, purple in the first two sectors, to go 0.007s quicker than Hamilton. Vettel lined up third, 0.438s down, while Max Verstappen was fourth and Charles Leclerc was P5. Back on track for a second run with fresh softs on all the cars, Hamilton was the first of the two Mercedes to cross the line. He did so with a 1:31.6 which was slower than his previous best. Bottas upped his pace to a 1:31.547 to take pole position by 0.023s and in doing so became the third different pole-sitter in three races. Vettel had to settle for third place ahead of Leclerc. Leclerc was at a disadvantage in the pole position shoot-out as Ferrari’s timing in Q1 meant when he came to complete his lap, he had to pass four or so cars in the final few corners. Down in 11th place, he wasn’t comfortably through and therefore had to do a second run, leaving him short a set of soft tyres for Q3. Verstappen finished with the fifth fastest time, the Dutchman unhappy with the traffic in the form of Vettel and a Renault which cost him a shot at a late hot lap. Pierre Gasly, appearing in Q3 for the first time as a Red Bull driver, was sixth. Daniel Ricciardo, Nico Hulkenberg and the two Haas cars of Kevin Magnussen and Romain Grosjean completed the top ten. The Haas drivers, though, didn’t set times as they also fell foul of the traffic and were left to accept P9 and 10. Qualifying got underway a driver short as Toro Rosso were unable to repair Alexander Albon’s STR14 following his massive crash in final practice. The driver, though, was thankfully okay. That meant only four drivers dropped out in Q1: Antonio Giovinazzi, George Russell, Robert Kubica and Lance Stroll – the seventh time in a row that the Canadian didn’t make it out of Q1. Giovinazzi failed to set a time due to yet another power unit issue. The Italian ventured out for two laps before returning to the pits where he stayed, sitting in his car until the clock ran out. In Q2 it was Daniil Kvyat, Sergio Perez, Kimi Raikkonen and the two McLarens of Carlos Sainz and Lando Norris who failed to progress. For Raikkonen that ended his run of 53 races in Q3. Starting back in Hungary 2016, it was the longest run of Q3 appearances for anyone on the grid.